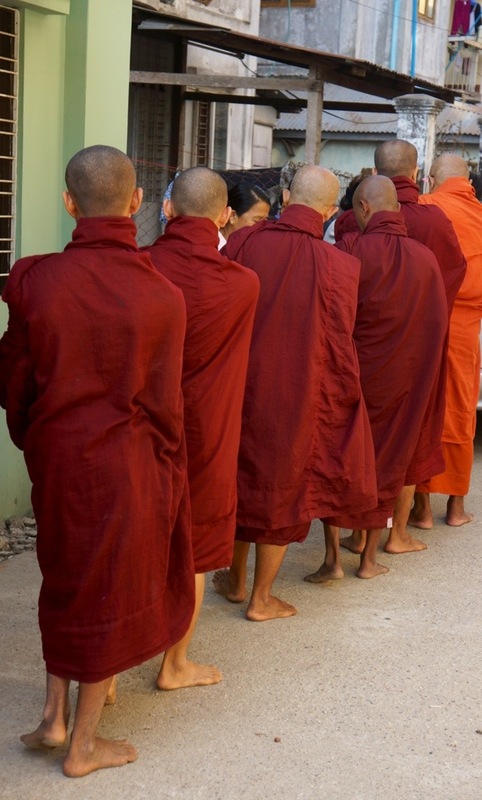 Breakfast, then off to a place near where Hillary lives to see and photograph monks going for alms. A bell/chime heralds their imminent arrival, and they pass by in a couple of minutes., extending their bowls for donations of rice. Off to the Golden Valley Art Centre, recommended yesterday by Damon and Stacy. 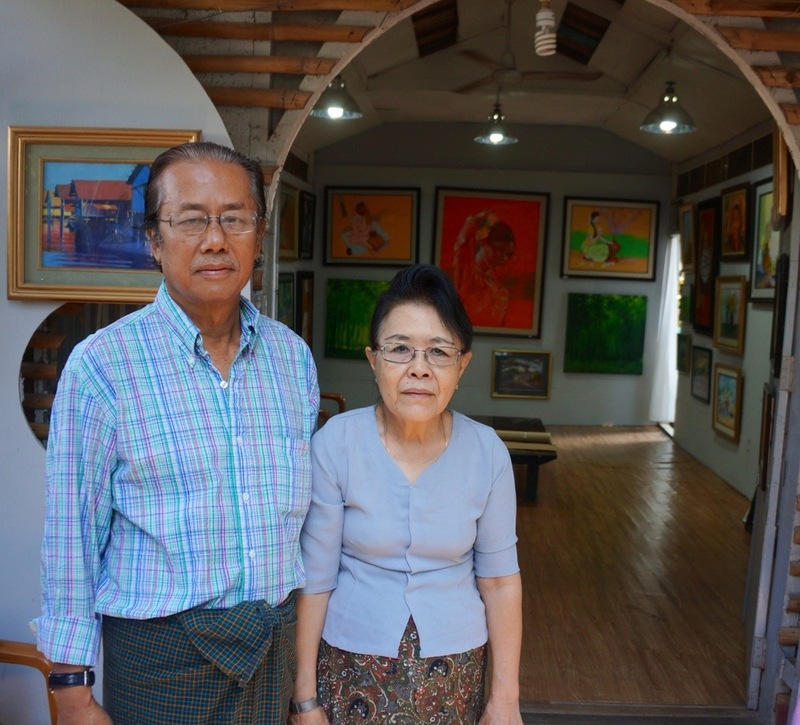 Run by Peter and Vicki, they represent 49 artists, all but a handful of whom are from Myanmar. Included among the artists are a son, daughter-in-law, son-in-law and 10-year old granddaughter of Peter and Vicki’s. They go out with groups of about twenty artists to paint on site in various Myanmar locales, and just yesterday returned from Bagan. We like a lot of the work and also like Peter and Vicki (pictured below). Wind up buying a small still life by the painter who Damon and Stacy have collected some twenty pieces of. 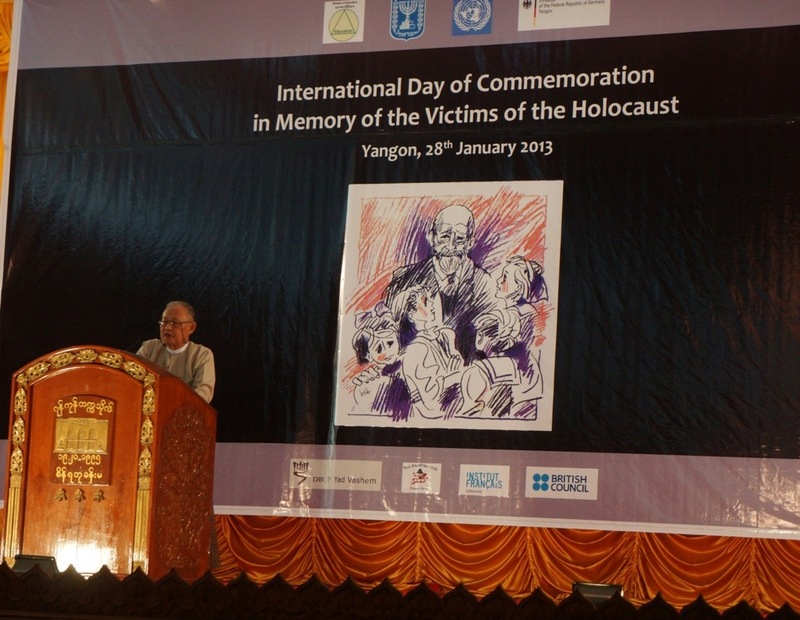 Drive to Yangon University, where Sammy Samuels had informed us there would be a Holocaust Memorial Service. There’s a large turnout, primarily of students, and the program consists of speeches, a poem recital, a Yizkor prayer led by Sammy and a moving short movie about a Polish boy who was raised in an orphanage in Warsaw. Sammy introduces us to various dignitaries, including the Israeli ambassador, the head of the UN in Myanmar and, most helpfully, the young man who is the new cultural affairs person for the US Embassy, Erik V.E. Eisele, who we introduce to Hillary and tell he must get in touch with Dotty. This could prove a very useful contact for Dotty, for Hillary and for Erik. We say goodbye to Sammy, who says we should stay in touch. Quick lunch before we visit an NGO called Myanmar Egress, which is engaged on training people in areas such as social entrepreneurship, leadership, mass communication and other related areas. What’s rather amazing is that they were allowed to exist under the military dictatorship. They were closely monitored, though, but now seem to be enjoying newfound opportunities. Among the training they are now doing is English language work for the Myanmar police forces. We meet several of the people involved and look in on a couple classes. To be honest, though, we do not emerge with a very clear notion of what they are about. The program manager with whom we met is to send us an overall description in English. Back to the hotel for rest and preliminary packing. Return visit to Shwedagon Pagoda for a farewell sunset. 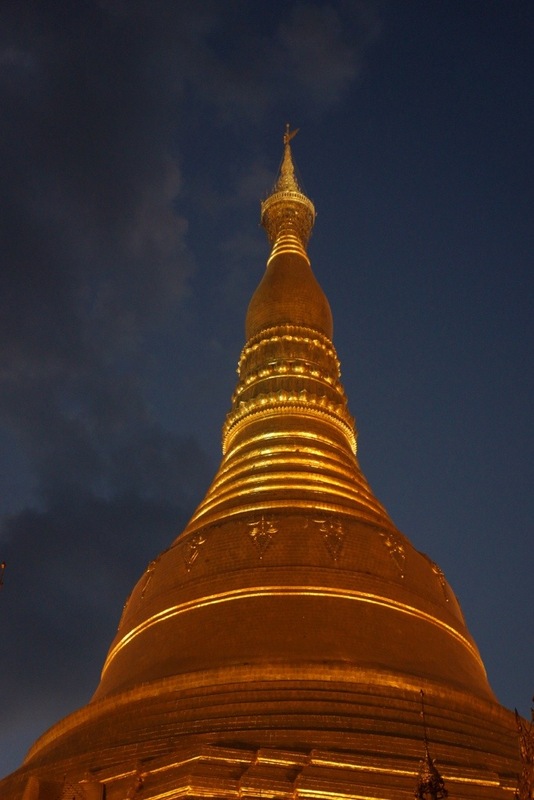 This spectacular, spacious pagoda is both an attraction for tourists and an active site of worship for Buddhists. The central spire rises more than 300 feet and is encrusted with nearly 8,000 diamonds, rubies, sapphires, topaz, and capped by a 76-carat diamond. Volunteers clean the floors daily on the day of the week on which they are born. Altars for each day of the week, two for Wednesday, ring the central area. 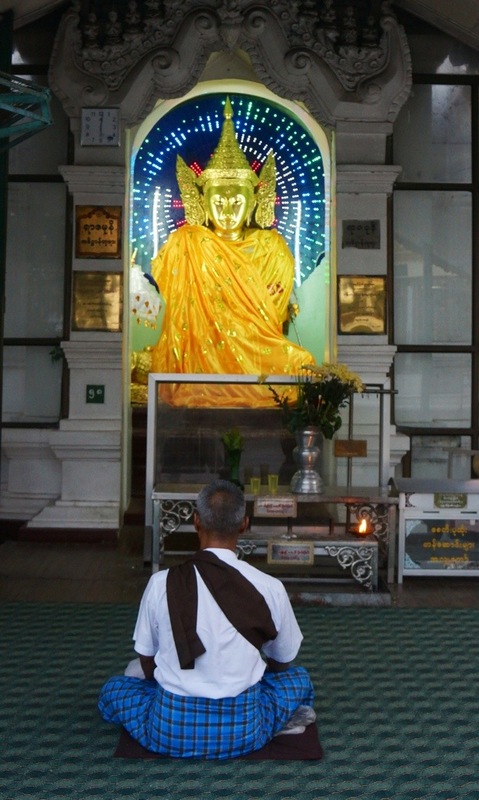 The pagoda is gilted over each year with donations from worshipers. Thiri, our travel agent, joins us and acts as our tour guide. 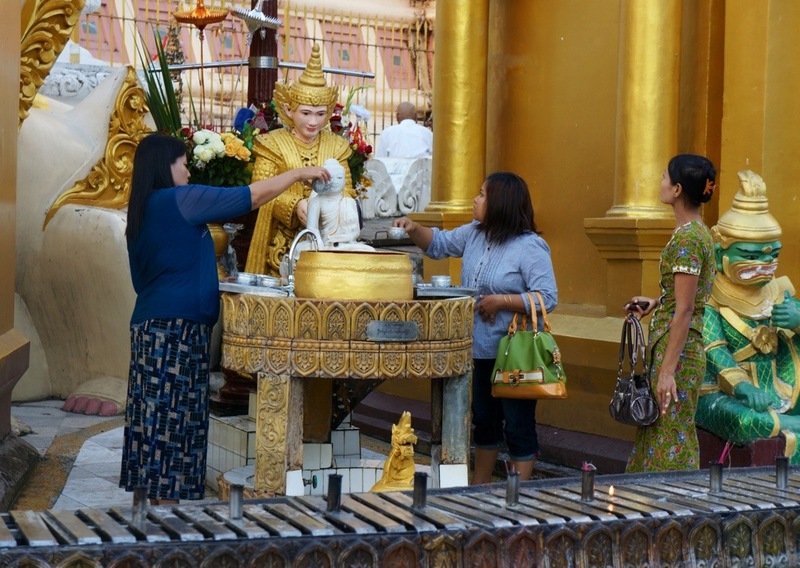 Crowded, but oddly peacefu, Shwedagon is a fitting end to our stay in Myanmar. Thiri and Hillary join us for a delicious dinner at the Governor’s Residence and we retire, awaiting a 4 AM wake-up call.